ALZETA®’s burner technologies are known for their low nitrogen oxide emissions. 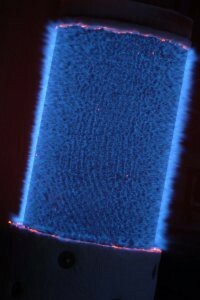 This feature of our technology is an inherent characteristic of premixed surface-stabilized combustion—temperatures are uniform at any point along the surface and operating temperatures are well below the peak NOx formation temperature range. ALZETA can assure minimal nitrogen oxide formation for all our burner products. 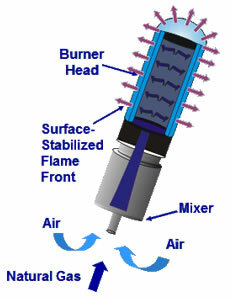 Common to all burners is premixed, surface-stabilized combustion. This is a two-step combustion process—first the fuel and air is premixed, then the mixture burns on the outer surface of the burner element. The surface acts as a barrier between the two processes. Conventional gas burners that mix the fuel and air where combustion takes place almost always have some zones operating at or above the peak NOx formation temperatures. The materials characteristics of each technology also enhance the performance of low NOx burners. Surface firing rate, heat transfer from the surface, and flame stability all play a role in minimizing NOx emissions. Duratherm™ and Pyromat™ burners further reduce nitrogen oxide emissions by operating at modest surface firing rates and by radiating energy away as combustion takes place, further reducing peak combustion temperatures. Benefits of achieving low NOx through premixed, surface-stabilized combustion include decoupling combustion from the influences of furnace or boiler design, such that the combustion chamber configuration has little influence on NOx formation. Nitrogen oxide emissions are therefore very predictable. ALZETA can assure your furnace or boiler will meet almost any low NOx emission requirement, anywhere! Contact us to learn more about our low nitrogen oxide (NOx) burners and how they can simplify your low NOx emission requirements.